Rebecca Parsons, our CTO, gave this talk at Collision Conf in June. It's an important topic, so we wanted to share it with you here. Everyone is biased. And so, while we may think of systems as impartial and even unquestionable, as we see in this piece, the systems are only a reflection of the people who build them and the data they are fed. How can we stop AI locking us into our old mistakes? With lots of clear examples, this paper is sure to get you thinking. What kind of data sets are the tools you are using trained on? How are your systems guided by your world view, and the demographics of your team? It's time to take responsibility for counteracting inherent bias in tech. 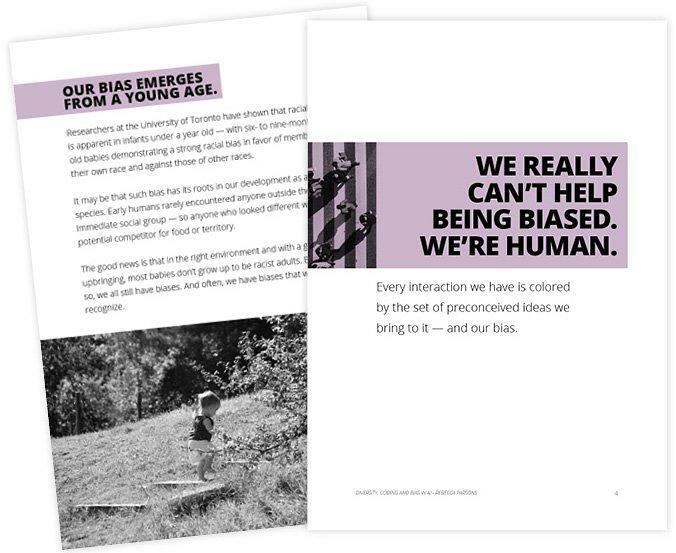 At just 20 pages, this short but informative e-book will provide a valuable insight to Dr. Parsons' thoughts and findings on bias in AI. We hope you enjoy it as much as we do.